Messier 3 (also known as NGC 5272) is a globular cluster of some 180 – 220 light-years across, located about 33,900 light-years away from Earth in the northern constellation of Canes Venatici (the Hunting Dogs), about 31,600 light-years above the Galactic plane and roughly 38,800 light-years from the center of the Milky Way. It is approaching us at approximately 147.6 kilometers per second. Although this star cluster’s apparent diameter is about 200 light-years, its tidal radius, beyond which member stars would be torn away by the tidal gravitational force of the Milky Way Galaxy, is even larger: about 760 light-years in diameter. It is one of the largest, brightest, and best-studied globular clusters. It has a bright, dense core with a diameter of about 11 light-years, comparatively large for a globular cluster, and half of this clusters mass is contained in a volume of only 22 light-years in diameter. Messier 3 is made up of around 500,000 stars, including 274 known variable stars; by far the highest number found in any globular cluster. It has a total mass of about 450,000 sun masses, and a luminosity of about 300,000 times that of our Sun. It is estimated to be between 8 and 11.4 billion years old. It also contains a relatively large number of so-called Blue Stragglers, blue main-sequence stars which appear to be rather young. 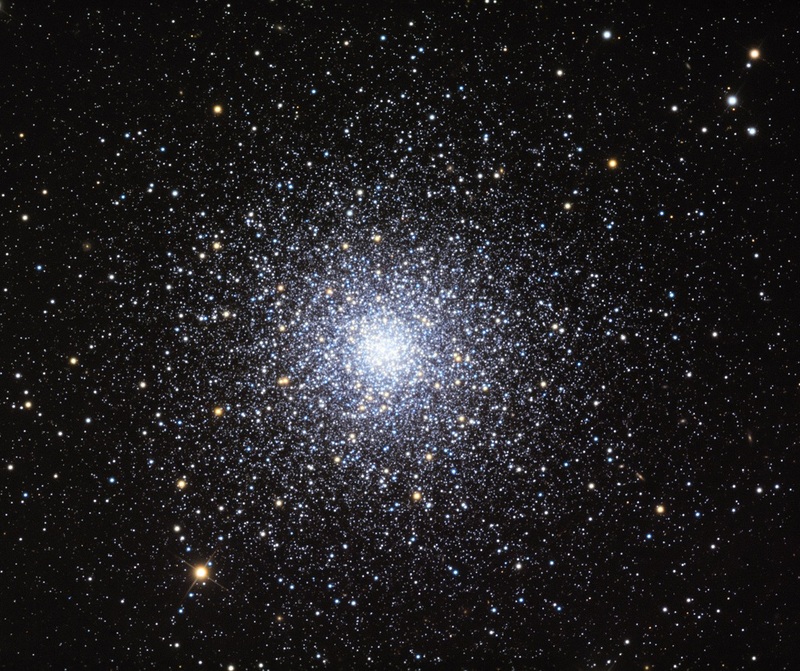 Since all stars in globular clusters are believed to be about the same age, it is possible these stars have had their cooler outer layers stripped away in close encounters, which occasionally occur when stars are passing through the dense core region of the cluster. Messier 3 is considered “metal-rich”, what means that, for a globular cluster, it has a relatively high abundance of heavier elements (elements other than hydrogen and helium). However, the actual proportion is 3.2–4.6% of the solar abundance.